Disclosure: RuggedTec contacted me to try their Roqbloq Rugged Outdoor Bluetooth Speaker at no cost to me. My only responsibility was an agreement to write this review. I was not pressured to make a positive endorsement. A love for the outdoors and electronic gadgets was the driving force behind the creation of the RuggedTec brand. RuggedTec is based out of southeast Idaho near world class fly fishing, hiking, skiing, and hunting. All of their products are dust, shock, and water resistant for those who love the outdoors. 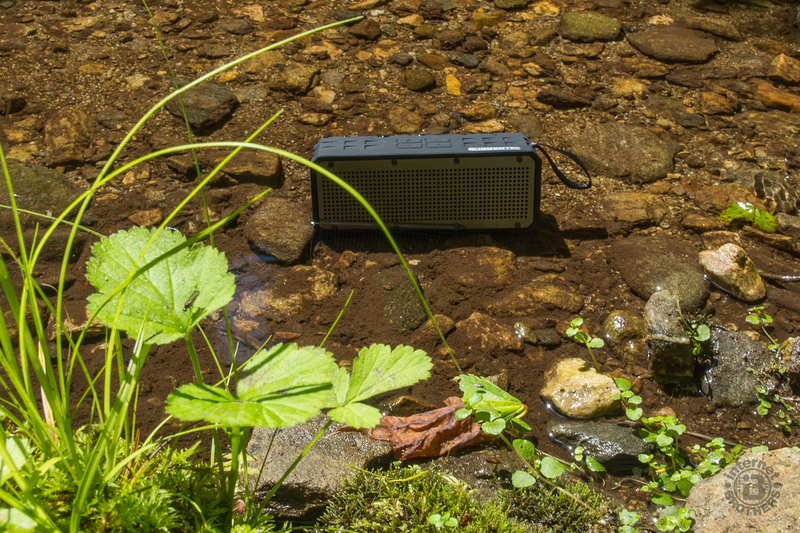 The RoqBloq outdoor bluetooth speaker is portable and rugged. It was designed with the outdoor enthusiast in mind. It is dust/shock resistant and is water resistant (IPX3 Waterproof rating). At 6″x2″x2.5″ and only 12 ounces it is compact and can easily be taken nearly anywhere. Don’t be fooled by its size; the 12W output makes it plenty loud with nice bass. The 1800mAH battery will operate for 8 hours. Easily charge it with the included micro USB cable. In addition to wireless bluetooth listening, you can also connect directly to other input devices with the included 3.5mm stereo cable. Get a phone call while you’re listening? The RoqBloq has got you covered there too. The built-in MIC allows you to answer phone calls directly from the speaker. In addition to phone calls, you can control your music directly. Change tracks and adjust the volume levels using the buttons on the top of the speaker. The black silicone covering with the front metal grill and bolts just looks rugged. The sound you get out of this speaker is amazing for its size, and convenient for those wanting an outdoor speaker solution. The RoqBloq works with any bluetooth capable smartphone or tablet. If you’re a technophobe, don’t worry, it’s very easy to setup. First charge the battery through the supplied USB cable, power it on, and pair the bluetooth. Generally your handheld device will display a list of available bluetooth connections. Simply select RuggedTec from the list, wait for the “connected” electronic sound from the RoqBloq, and you’re all set to play music. I decided to try out the RoqBloq on a hike in Cataloochee Valley in Great Smoky Mountains National Park. Since I would be hiking alone, I liked the idea of having music playing, to act kind of like bear bells. The trail certainly had plenty of dirt, rocks and creeks to check out the dust, shock and water resistance. It isn’t what I would call small, but it isn’t unweildy. It’s maybe half the size of a brick, but the weight is nothing like a brick. When I first pulled it out of the packaging, I looked to see if there was more in the box because it seemed to be very lightweight for the size. I carried it in one of the water bottle pouches in my pack. It fit perfectly, and slipped in and out of the pouch with ease when I needed to mute the sound. 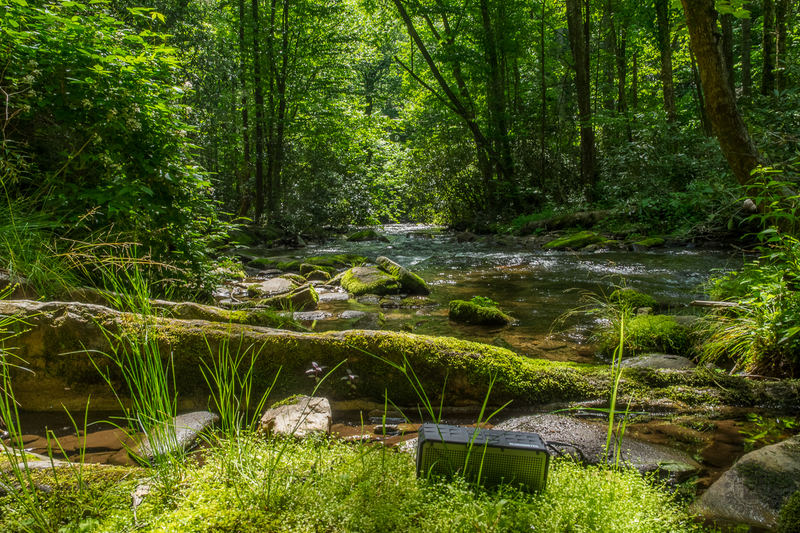 The RoqBloq rests comfortably on a bed of moss at Caldwell Fork. This isn’t a high-quality audiophile’s sweetheart stereo speaker, but for its size it packs a pretty good punch. I found I needed to turn down the volume from the level I normally listen to ear buds or headphones. In fact, when I passed another pair of hikers, they commented about how nice the music sounded. And unlike headphones, with a speaker I am still able to hear the ambient sounds of the forest in case of emergency or unexpected wildlife. The sounds from the RoqBloq are enough to let any wildlife know I am there, but it doesn’t drown out all other sound like headphones so that I am still safe and aware. At various times along the hike I ran little tests on the RoqBloq to see if it performed as advertised. With the silicone encasement, it is supposed to be durable and shock proof. So… I dropped it from chest height onto a solid slab of granite. It bounced, but kept right on playing, never missing a beat. It is advertised to be dust proof as well. There was plenty of dirt on the trail and sand beside the creeks. I grabbed handfuls of each and dumped them all over the RoqBloq. No harm done. With a few shakes I was able to get all the dirt and sand back out of the small grill holes like nothing happened. This would be great at the beach where sand seemingly gets in everything. Last came the big test. Just what do they mean by the RoqBloq being water resistant? Well, I set it down in the creek. See the photo below. It just kept right on playing. So I pushed it down into the mud. None the worse for wear. They may say water resistant, but to me this thing was water proof. I even completely submerged it (see photo at the bottom) with no dire consequence whatsoever. The RoqBloq works no matter what. 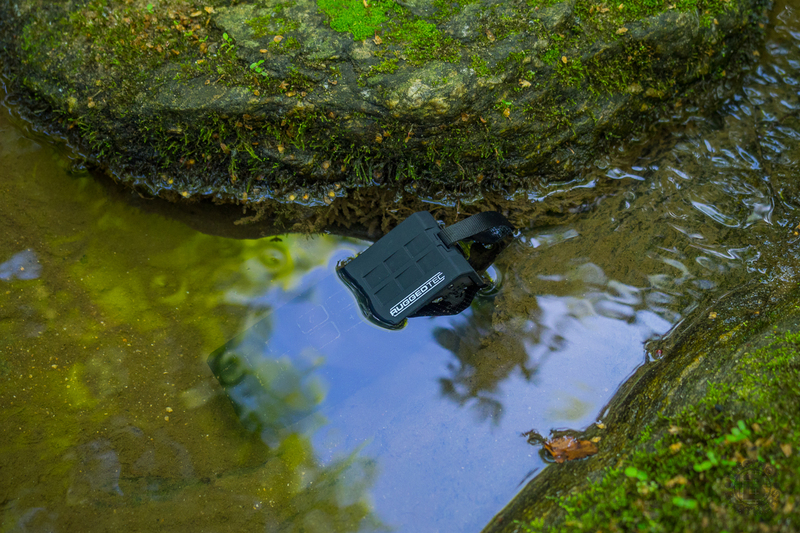 The RoqBloq plays music while sitting in a creek. The compact RoqBloq Rugged Outdoor Bluetooth Speaker comes in either red or black and retails for US$69.00. All RuggedTec products have a one year warranty, and if ordered direct from RuggedTec you will receive free shipping. The RoqBloq is an extremely well-made, durable product. It definitely does everything advertised, perhaps even more. I found the sound quality to be surprisingly good for a device so compact, and it is quite easy to operate. The 8 hour battery life is enough to last through nearly any activity, and recharging is a snap. Hiking may not be the best application for a RoqBloq, but it certainly works fine in the right circumstances. However, take it to the beach or on a picnic, to the amusement park or out in a canoe and the RoqBloq is a perfect means of adding favorite tunes to your surroundings. Hey, if you take it to the swimming pool this summer and the kids splash it… so what. RoqBloq submerged in a reflection of the sky.